Happiest of Fridays to you! 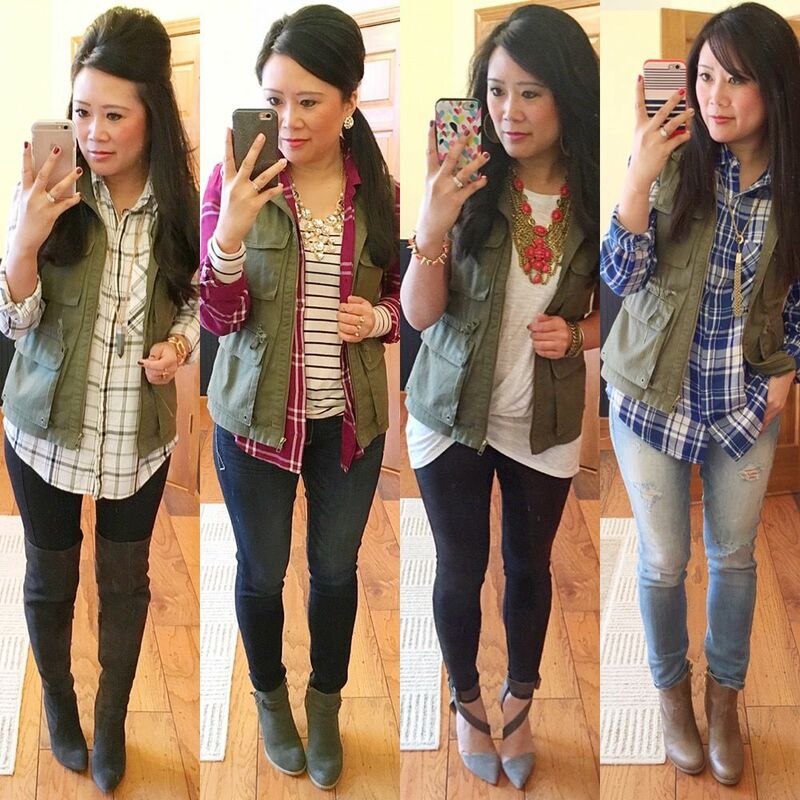 Friday means I have another roundup for you and this week, I thought I would share some inspiration for styling a military vest. I've actually remixed this before in this post here, but I've accumulated a ton more outfits since that post that it was time for another! 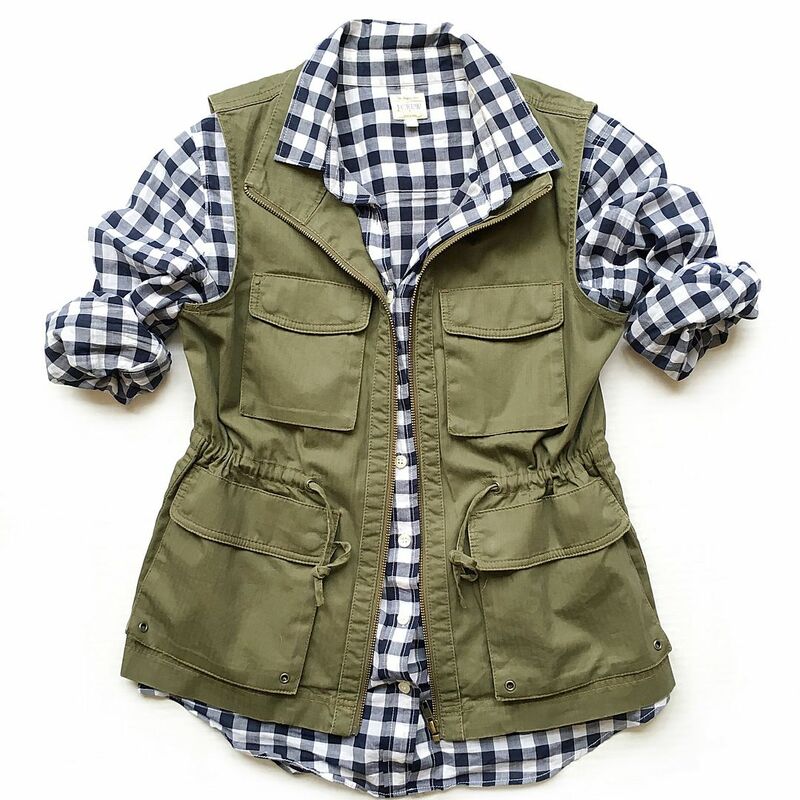 This vest is seasonless and classic and I would be absolutely mortified if anything ever happened to mine. It's the perfect layering piece, and I'm laughing at myself a bit because I remember when I first got it, I had trouble styling it so I had to scour Pinterest for ideas. Now I have to refrain from wearing it with all the things. Funny how that happens. Well, let's get started! You can see additional styling ideas in this post here This outfit is still one of my all time favorite outfits on the blog. 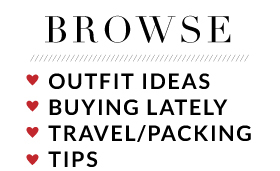 Seems silly but I just love all the eye candy and the perfect mix of dressy and casual. Overall, it's just a really fun outfit. Oooh, there is something so perfect about white, olive, and cognac in the summer. I forgot how much I loved this outfit and how much I loved that tee! I need to find it again! Also - how many days until the Anniversary Sale?! If I could wear one outfit over and over again in the winter, it would be this one. 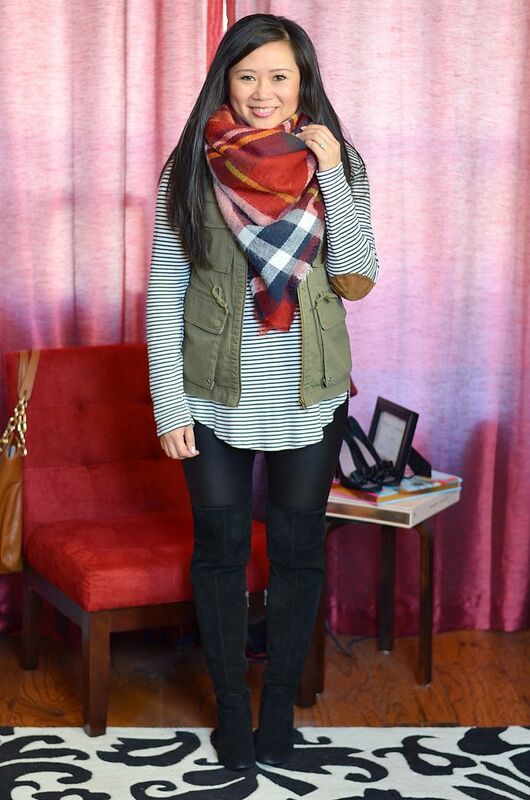 Striped tunic, blanket scarf, leggings, OTK boots, and my favorite vest. It's all good. And I love how the vest adds interest and warmth without a ton of bulk. It's perfect I tell ya. So I'm cheating a little because this outfit was already shared in my original vest remix post here. 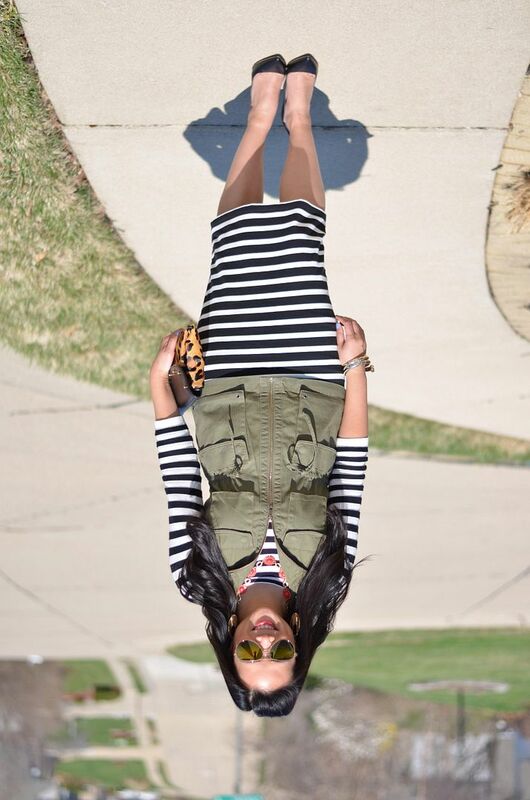 But, I cannot not share it again because it is truly one of my all time favorite ways I've styled this vest. It's really the epitome of my style - the mix of casual and dressy, a pop of color, some pattern mixing. I'm obsessed and I could wear this over and over. 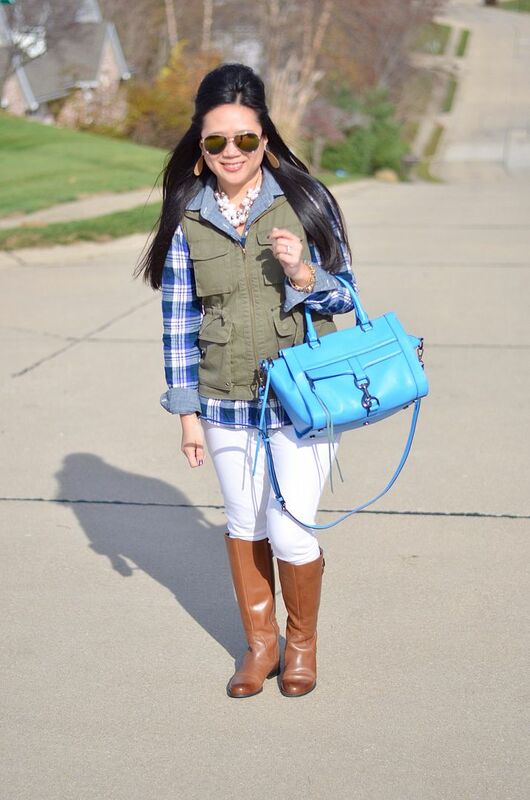 I feel like this is the most traditional way to style the vest - with plaid and riding boots. But of course I still need to feel like a lady, so I added some faux pearl baubles. This vest is perfect for shopping in the winter - you know, when you go to the mall and need to be warm from your car to the door, but don't want to lug around a heavy winter coat all day while you window shop? Plus the pockets make it extra convenient for keeping your necessities close like keys and cell phone. And here are some bonus selfies to finish out the post. I love how sassy it looks with leggings and pointy toe pumps or OTK boots! It really is the perfect canvas. I am sorry to tease you with mine because it's long gone, but I've found a few good ones at different price points that look like really good candidates! Thanks for reading - enjoy your weekend! 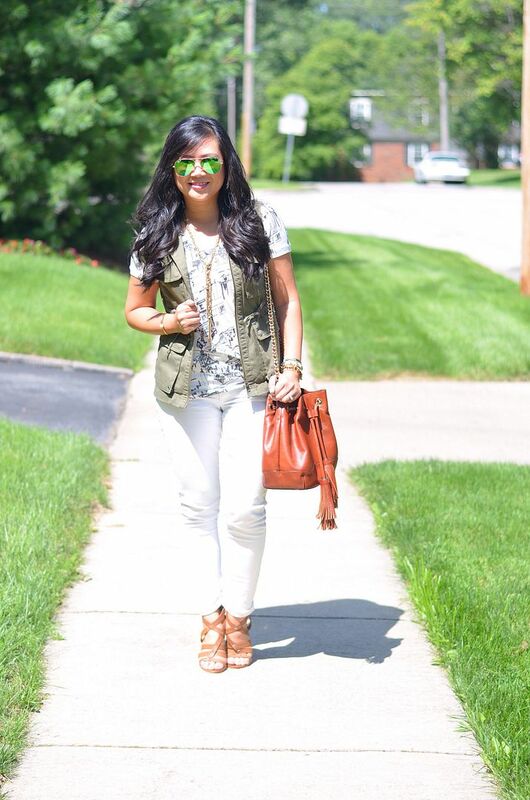 Loving all of this inspiration...you have worn this vest so many fabulous ways! I might just wear my vest today, thanks for the inspo. 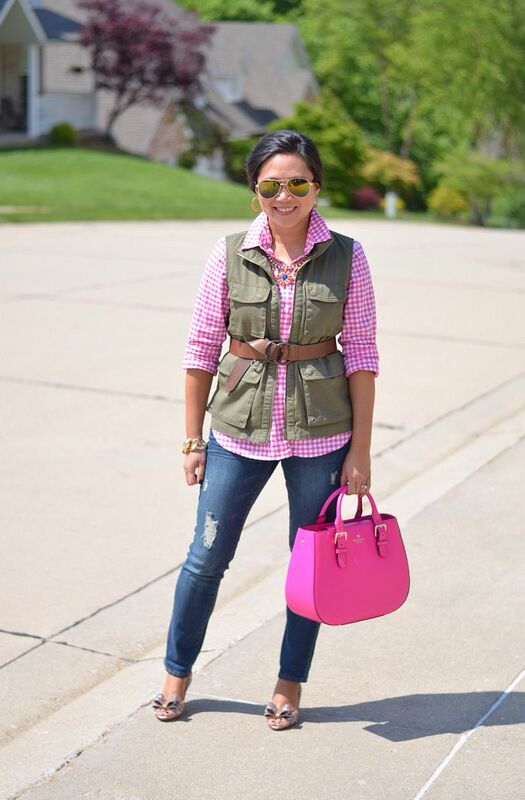 I love how you paired that vest with pink! The contrast of feminine and casual boyfriend works so well together. Happy weekend! Wow! I cannot believe how many options you have for styling this! (And I always love the throwback posts) I have tried on a couple of these and for whatever reason just don't feel like "Me" in them so I guess I will just have to continue to admire yours! Love this! You've worn this vest so many different ways, I am tempted to grab a green cargo vest of my own! I loved it the most with the all white look. I agree, it really is a versatile piece! 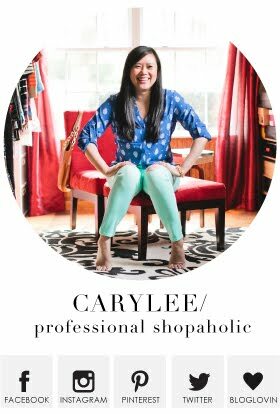 Wow you can wear this vest with practically everything! Love all these options! Such a versatile piece.